Lean is not new to manufacturing. The principles, founded in the Toyota production philosophy, gained popularity through the late ’80s and ’90s as a way of increasing production efficiency. The essential tenets of lean manufacturing require process engineers to evaluate waste in eight key areas of production: Transport, inventory, motion (workers moving around too much on the floor), waiting (production sitting idle), overprocessing, overproduction, defects and undeveloped talent. Lean manufacturing systematically analyzes, targets and eliminates waste in each of these categories in a continuously self-regulating cycle. The advent of the Industrial Internet of Things (IIoT) has accelerated adoption of these lean manufacturing principles, because big data from the digitization of machines and processes across the shop floor make the process easier. When implemented correctly, the “smart factory” automatically feeds data from embedded assets on the production floor into rigorous machine learning models. These models analyze processes for inefficiencies and advise precisely where the system can be fine-tuned. 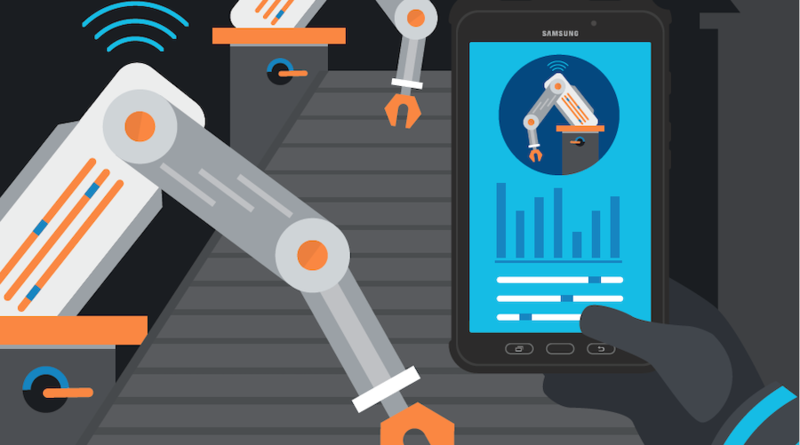 Through advanced analytics and by using mobile devices to view and work with these engineering insights, smart factories are relying on lean manufacturing to realize greater production efficiencies. A 2014 McKinsey report predicted that corralling advanced analytics and lean management could be a bonanza for large manufacturing companies, increasing revenue by tens of billions of dollars. Process engineers can process the tea leaves from big data to zero in on key drivers on the production floor. The tightening of unnecessary movement on the shop floor, for example, is a low-hanging fruit and an easy “get” with digitization and the use of mobile devices. A plant worker who has to process a work order might ordinarily have to work with a paper copy from the head office, call a supervisor for necessary permissions and type a report at the end of the day. In addition, the worker might run into systems challenges and machine issues, which might need to be traced by working through paper logs or computer logs inaccessible from the shop floor. Equipping plant workers with mobile devices such as the Samsung Tab Active2 allows workers to log into the manufacturing execution system (MES) from the plant floor, access work orders and processes in the right sequence, compare photos of finished products against prototype models if needed, and more. For managers, the Samsung Galaxy Note9 provides the S Pen stylus for signing documents and delivers desktop capabilities when docked through Samsung DeX. This means plant managers and workers can access all desktop functions on the shop floor without having to travel back and forth to the office. Such simplified task management through mobility eliminates waste and delivers greater production efficiencies. Mobile devices like these enable workers to trim inefficiencies in another key lean manufacturing pillar: defects. The high-powered camera built into the device can take pictures of defective products and, using augmented reality models, overlay these images against the prototype to precisely pinpoint quality issues. Workers can also shoot video of the production process if needed and upload these along with data logs as visual documentation of machine issues. Such engineering insights lead to a faster and more comprehensive understanding of the problem, so plant managers can address waste issues more efficiently. The biggest advantage of lean manufacturing in smart factories is that it is a continuous and self-auditing cycle. Smart factories constantly work toward the goal of improvement in all eight pillars of the lean manufacturing philosophy. IIoT and mobile devices anchor this necessary push of using big data to get there sooner — and more efficiently.